Please note that I have never read the actual comic book, so my review may not be completely valid. I read a few reviews on it, when it came out, so my expectations were not that high, when it finally came out on DVD. In my opinion the whole background story is utterly lame. 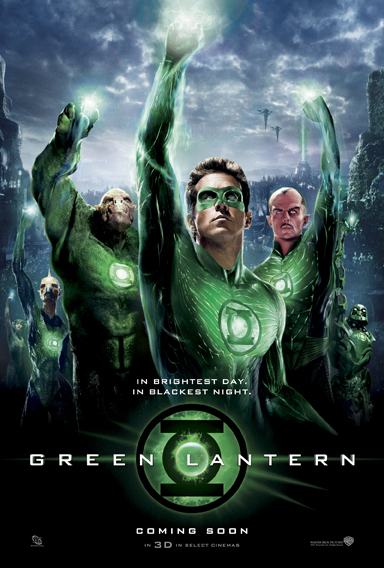 A ground of aliens in a universal core wearing a magic ring is acceptable, but what in the world is the lantern for? Why cannot this major core of elite defenders fight this single yet nasty monster? Especially when some human punk with absolutely no training can. Then there are are whole bunch of other small but through power of number significant details, that just makes this movie lame. Eg. the voice over introduction is lame, a major part of the dialogue is lame etc. Despite all this plot and story wise lameness, there are some good things about the movie also. Ryan Reynolds impressed me a lot. I expected him to deliver a performance equivalent to Two Guys, a Girl and a Pizza Place, but actually did a decent job. Blake Lively looks nice, but it is sometimes a bit odd to see a girl you recognise from a teen TV-show. Mark Strong only has a minor part, but as always delivers a solid performance. I had har hard time recognizing him through all the CGI effects. Speaking of CGI effects, that part was actually done really well, and it what it holding this movie up for my part. It makes me regret not seeing it in the cinema, and I could imagine that it would look fantastic in 3D. Kudos for that part at least. If you are a fan of the DC multivese, it is recommendable to watch it. If you like super hero movies, there are a lot of better alternatives out there. This is not a good first time experience with this sort of movies, so do not use it for introducing your date to your geeky world of super heroes and villains.